Cassava Fufu is the most traditional Nigerian fufu meal. Here, I will give details of how to extract it from cassava tubers. For how to cook it, visit the Cassava Fufu page. 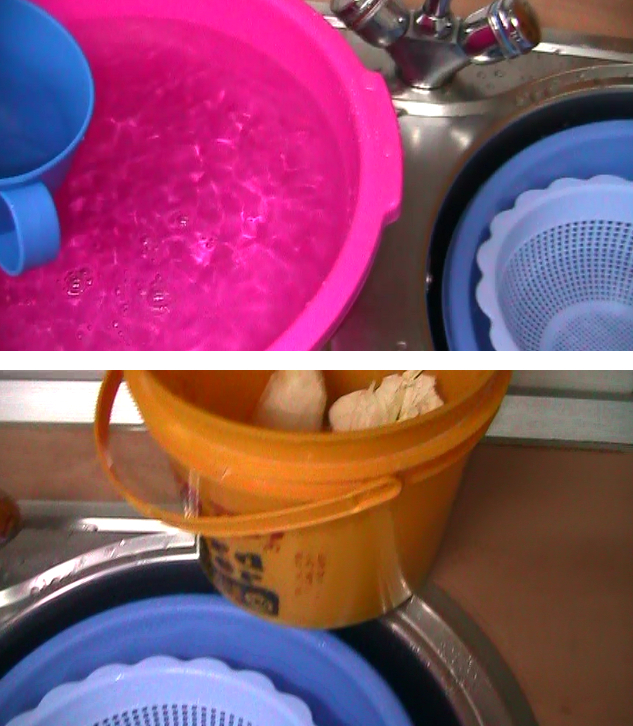 Water is used for soaking the cassava tubers and when separating the chaff from the cassava fufu. Baking soda: Freshly harvested cassava ferments in 3 to 4 days. If it is not freshly harvested, it may never ferment especially when you buy the cassava outside Africa or South America. 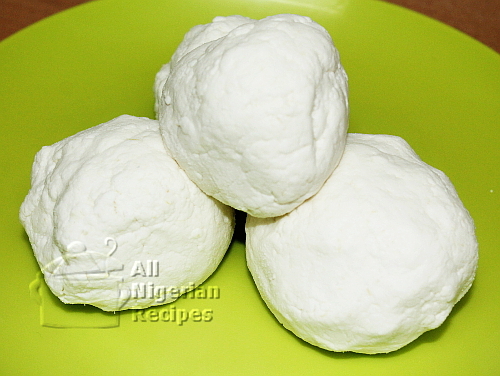 If that is the case, add baking soda or sodium bicarbonate to the pieces of cassava before leaving it to ferment. This helps with the fermentation. For 1 medium tuber of cassava, add 2 teaspoons of baking soda. If you just harvested the cassava from your farm or garden, there will be no need to add this catalyst. Lime juice helps keep the cassava fufu from darkening. You will use the container with cover for soaking the pieces of cassava tubers after peeling them. You will place the sieve in one big bowl while the clean water for rinsing is placed in another. The sieve is used to separate the chaff from the cassava fufu. Sieves that are abrasive on the inside do a better job of this that those that are smooth to touch. Cassava fufu, especially the water used in fermenting it, has a very pungent smell. You need gloves to handle these so that your hands will not smell for weeks after this task. A muslin bag is any bag that allows only water to pass through it. It is usually sewn with cotton or calico material. Some people use brand new pillow cases for this. You need a cup for bailing the clean water onto the cassava fufu in the sieve. A plastic bag helps make the container airtight before setting it aside to ferment. 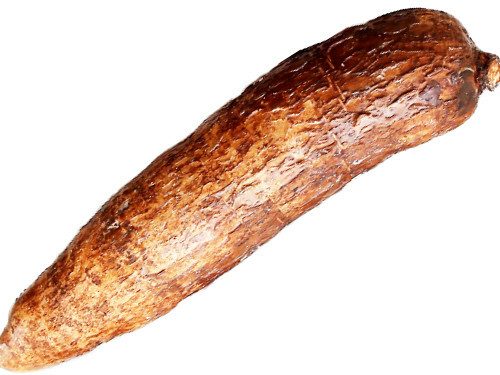 Cut up the cassava tubers into 2 inch long cylindrical pieces and peel off the skin. Rinse them thoroughly and put in a big enough container with a cover. Pour cool water to cover the pieces of cassava. Drape the top of the container with a plastic bag. Then cover with the container cover. Keep in a warm place and leave it alone to ferment for 3 to 4 days. Do not touch it during this time. Don't change the water, don't do anything to it. After 4 days, you will notice that it is completely fermented. Pour out the water and set the container aside. Set up the utensils you will use for sifting the cassava fufu. Click here to see what my set up looks like. Put a small quantity of the fermented cassava in the sieve. Crush it by rubbing them with your hands. Add some water to it. The cassava fufu will pass through the sieve while the chaff will remain in the sieve. Keep going till you are left with just the chaff. Rinse it with the clean water. When done with the first batch, repeat the process for the rest of the fermented cassava. When done with all the fermented cassava fufu, cover the bowl and leave to settle for at least 3 hours. After at least 3 hours, you will notice that the water is clearer. Slowly decant only the water and pour the cassava fufu into the muslin bag. Place it on the side of your kitchen sink to drain. To speed that up, place a heavy object on the bag of cassava fufu. Leave it to drain till the cassava fufu feels solid to touch. Put the cassava fufu in a container, beat it down to make a smooth surface and sprinkle some lime juice all over the top. Cover and place in your fridge till when you want to pound it. Visit the Cassava Fufu page for how to cook and pound it.